Home BEST OF KONGRES Behind the scenes New looks on top … or where are the bees? Cankarjev dom – Cultural and Congress Centre is more than 40 years old venue that has recently undergone a complete renovation of its roof. The question is: where are the bees? Cankarjev dom – Cultural and Congress Centre got a new look. Its 40 years old roof was renovated. The roof, like the rest of the building, has been protected as a cultural and historical monument; thus, the restoration had to be planned according to the rules of monument protection and it was quite complicated to plan each detail. 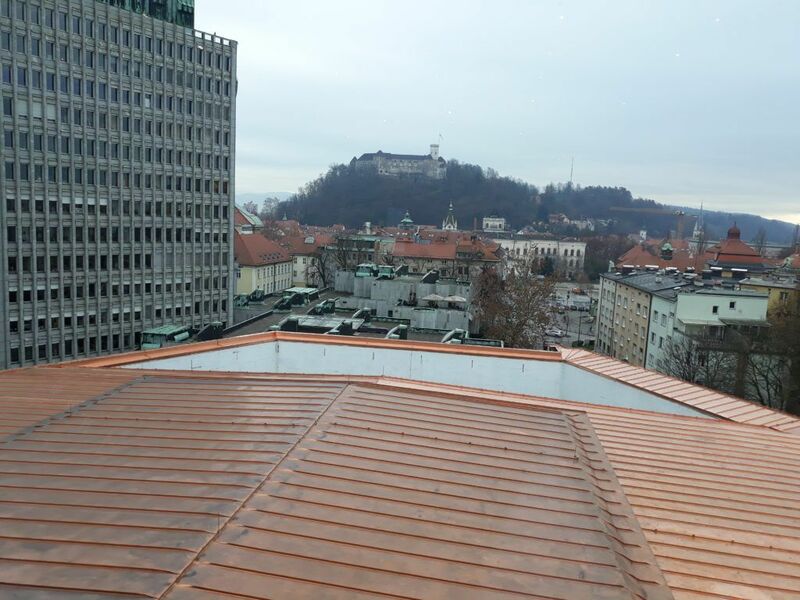 However, the works were successful despite the very precise and careful job that had to be done on a protected roof, and the Cankarjev dom boasts a new shiny roof. The renovation of the copper roof took place from early September until late November. Cankarjev dom, with the financial help of the Slovenian Ministry of Culture, hurried up with the works in order to finish the renovation worth almost 2 million euros before the winter would have kicked in. At the same time, Cankarjev dom’s immediate neighborhood had also been under renovation, so after the roof’s restoration and the new looks of the Erjavčeva street, the Cankarjev dom’s vicinity “will be a real candy,” as Uršula Cetinski, the general manager of Cankarjev dom wrote in her online blog. Indeed, the Cankarjev dom’s surface on top and around will be even more glamorous than it has already been for many decades of its cultural and congress activity as one of the most important Slovenia’s venues. The almost 2 million renovations (1.539.254,33 € + VAT) took 60 days and 45 workers worked on the highest set copper roofs and their 2700 sq m, while on the west side the 120 sq m of balconies were renovated as well. Above the Grand Reception Hall and on three other locations, there were concrete surfaces in about 1200 m2 that were also renovated. All in all, the main materials used and in the restoration were copper, concrete, wood, sand, concrete slabs, iron, bitumen waterproofing, and thermal insulation (mineral wool and XPS materials). So, what about the bees from the title of this article? Well, in case you don’t know yet, the fact is that Cankarjev dom on its roof hosts real beehives in which real Carniola bees produce real and delicious honey that Cankarjev dom uses as a protocolary gift. We asked the Cankarjev dom’s staff, “Considering that there was a renovation going on, well, what then happened to the bees? Where are they?” And Cankarjev dom told us that the beekeeper who takes care of the bees took them home to rest and they will only come back in April when the winter cold will be all gone. We are relieved. The bees are ok. And so is the roof. And so is Cankarjev dom which is now even shinier than it has already used to be.